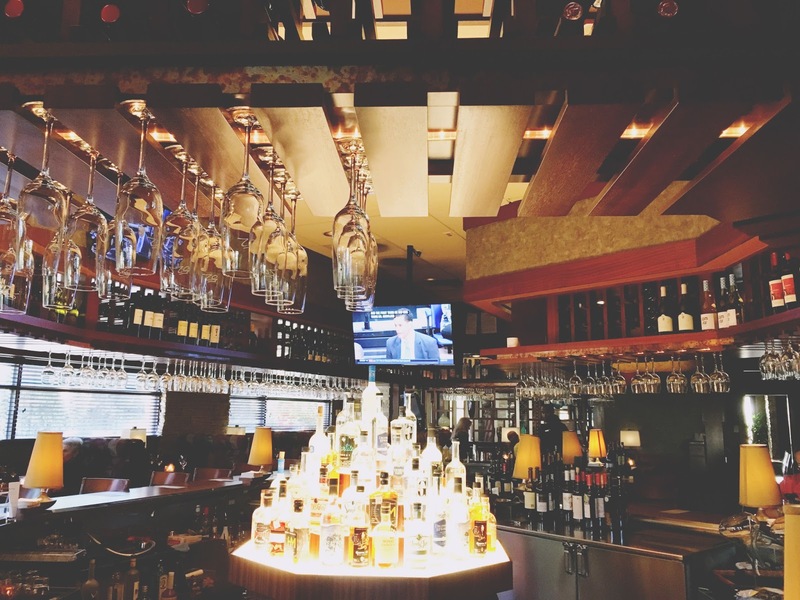 A few weeks ago (when it *officially* became spring), Jon and I attended a media tasting of Seasons 52's spring menu at their Houston restaurant on Westheimer. 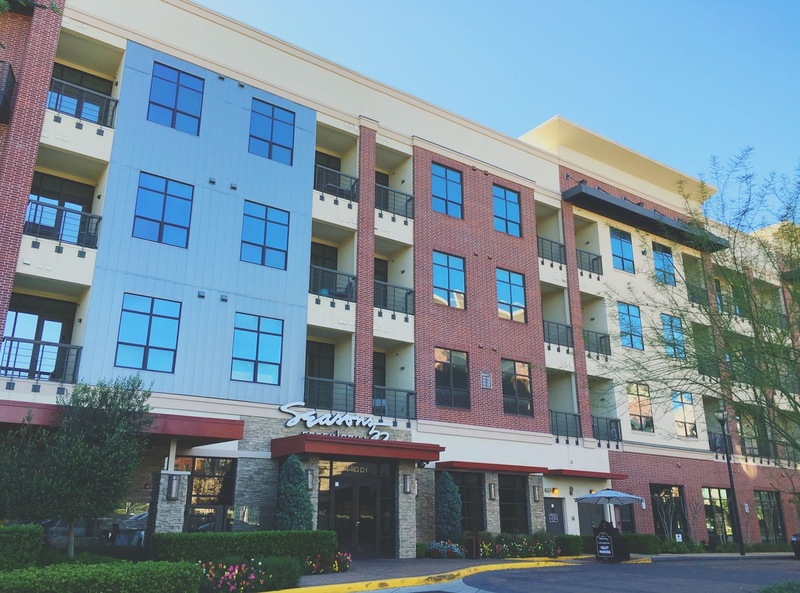 We were fortunate enough to also sample their insanely delicious winter food menu at the same location in Houston back during the deepest of dark moments of my life (I kid, I kid! But really, I hate winter with a loathing fiery passion), so we were super pumped to get a sneak peak of the restaurant's spring food action! The first part of the evening consisted of a cocktail party in one of the elegant back party rooms. 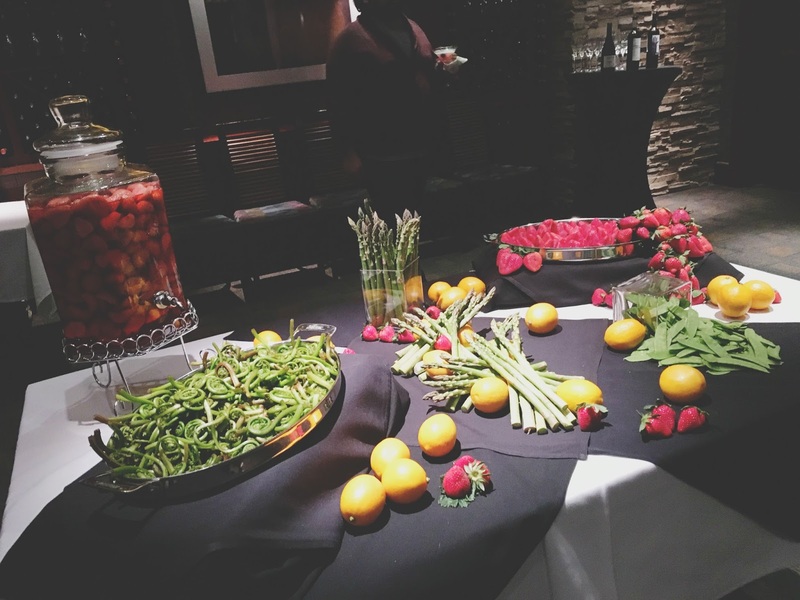 The spring menu has a focus on foods that flourish in - you guessed it - the spring, such as strawberries, lemons, asparagus, snow peas, and fiddlehead ferns. 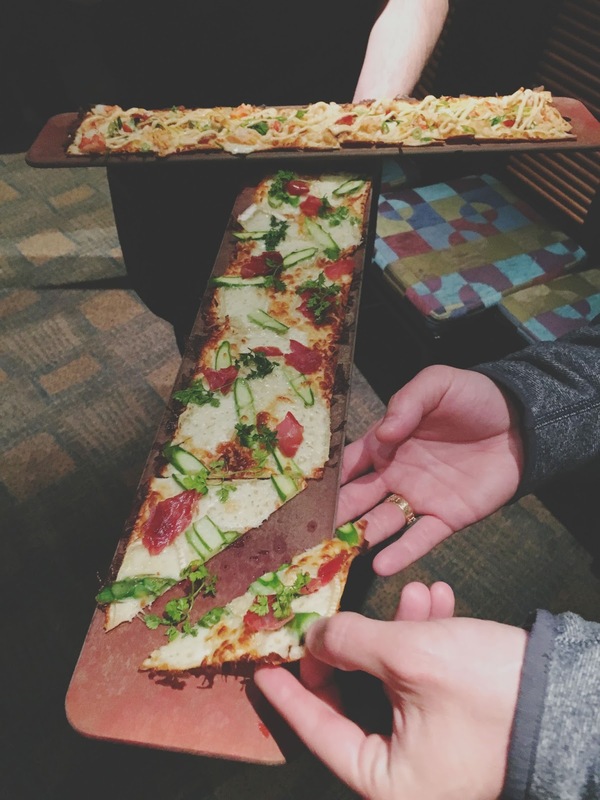 I was still subscribing to a vegan diet at that point, so all of the restaurant's cheese- and meat-topped flatbread appetizers went to Jon. 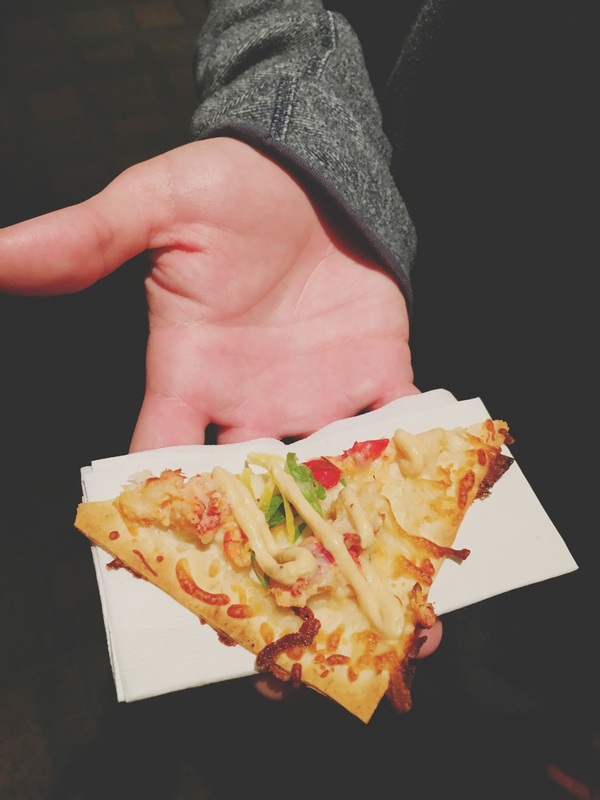 He enjoyed the prosciutto & asparagus flatbread with Camembert cheese, which he said was salty and crispy, and he "would order a big pizza of it." He also loved the citrus-y, light lobster and fresh mozzarella flatbread. 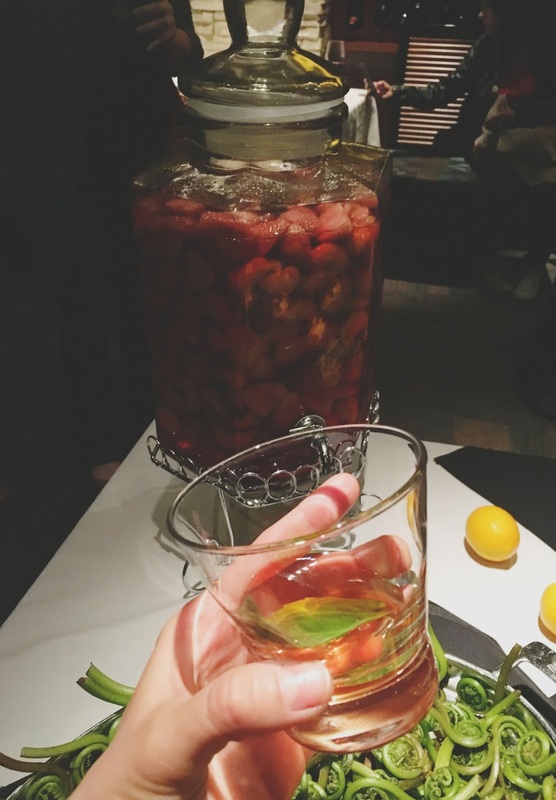 I sampled one of the restaurant's seasonal cocktails - the strawberry basil infusion - and I went nuts over it. The martini contained strawberry-infused vodka, fresh basil, and agave. It was sweet, smooth, wonderfully syrupy, and fragrant, and it had a little bite at the finish. Jon and I loved this drink so much, we started brainstorming how we could re-create this using our own Houston patio basil! We also sampled three of their wines from Brazil - not something you see every day on a restaurant's wine list. 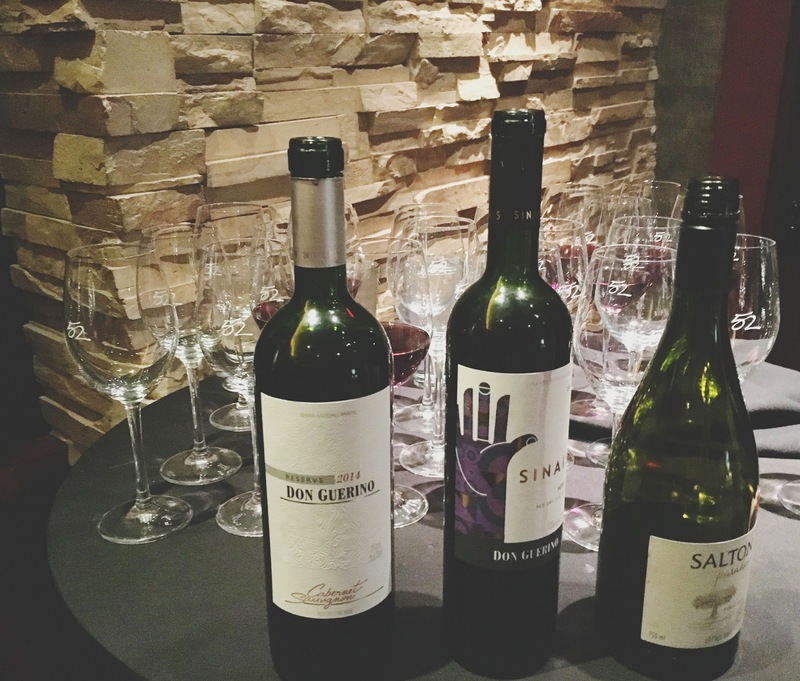 Brazilian wines are often overlooked, and the reason Seasons 52 added them to its spring list is in celebration of the upcoming Olympics! Pretty cool, right? First I tried the Salton Paradoxo pinot noir, which pairs well with lighter items. It had a light spice to it, and a smooth finish. Next up was the Don Guerino Sinais merlot, which had notes of pepper, vanilla, and tobacco. It also had a bright feel, and was sweeter and more tart than the pinot noir. Finally we tried the Don Guerino Reserva cabernet, which had aromas of spices, red fruits, raisins, coffee, and vanilla. After the cocktail reception, we were escorted to the restaurant's dining room for dinner. After we were seated, we were presented with a glass of Cuvée Sainte-Anne champagne, a heartier, woodsy wine with almost a cheesy aftertaste. 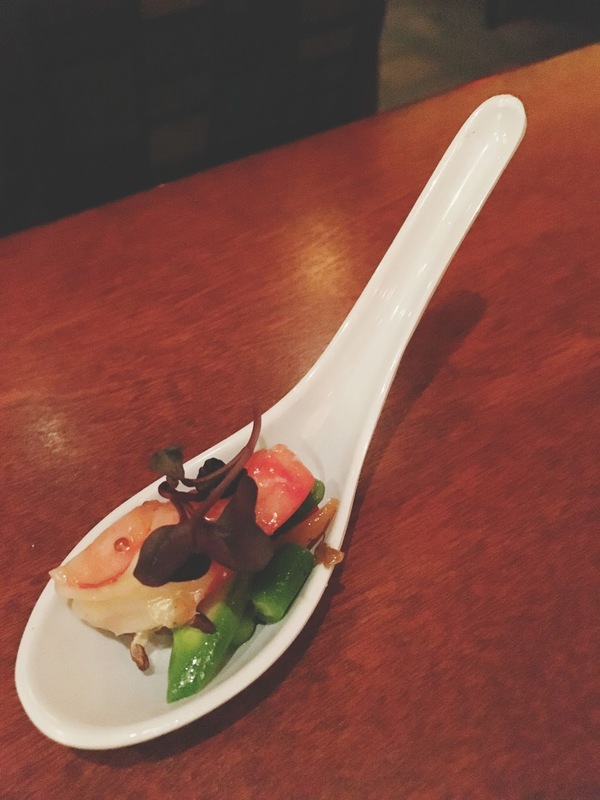 Jon tasted the Chef's Spring Amuse Bouche of shrimp atop fresh vegetables. He said the cold palate cleanser was fresh and light, and had a coleslaw type of effect. 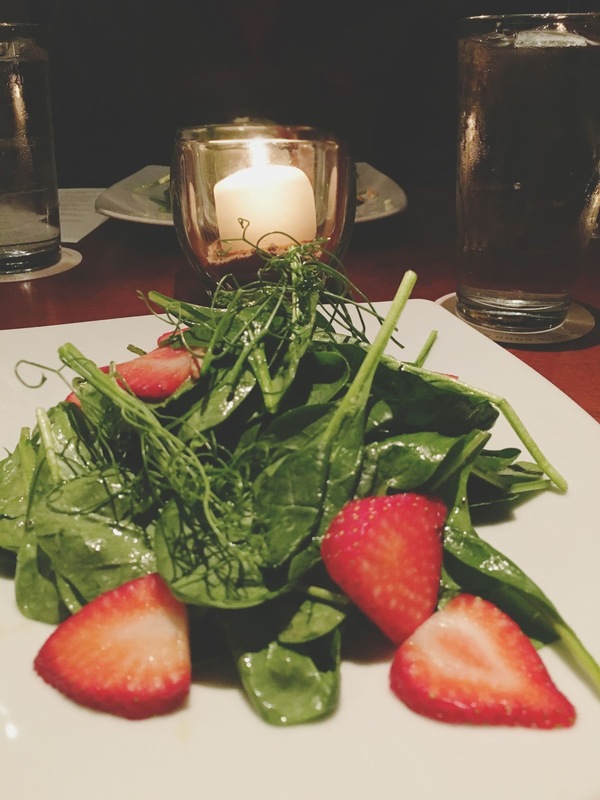 We were both given a spinach salad (mine was sans gorgonzola), which consisted of spring strawberries, pea tendrils, toasted pine nuts, and a 15-year aged balsamic drizzle. The salad was nice, tart, light, and paired beautifully with the wine, softening the cheesiness of it. The pine nuts were most notable, in that they added a great touch of smoke to the salad. The next course of food consisted of caramelized grilled sea scallops with lemon risotto, paired with a glass of Mer Soleil chardonnay. 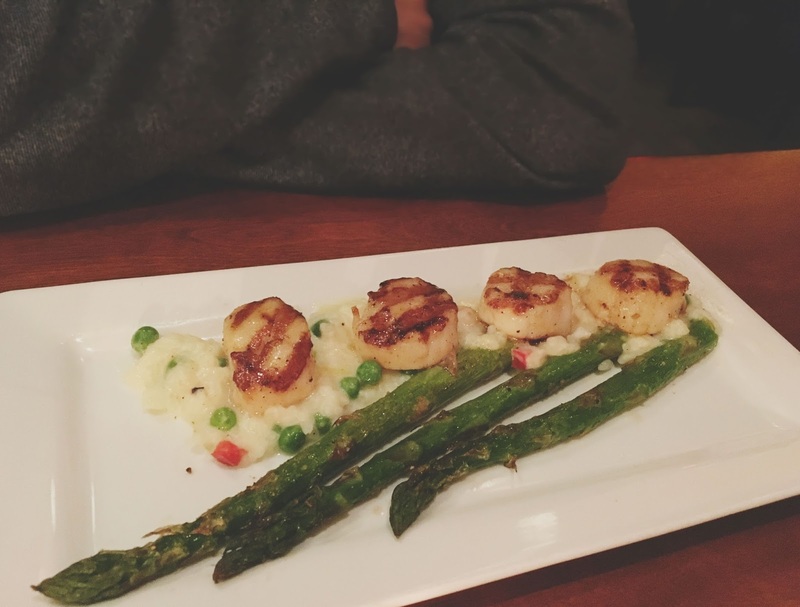 Jon said his scallops, which were topped off with a lemon butter, were lemony, zesty, and springy! The wine had a floral smell and a sweet caramel, honey, and butterscotch taste. 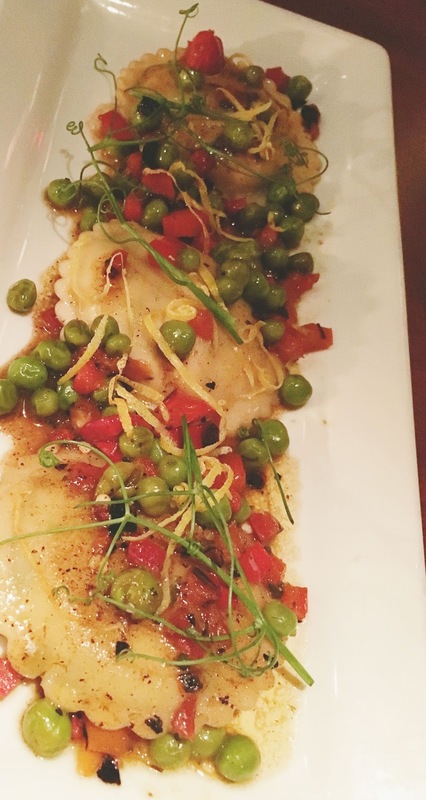 After that, Jon received some meyer lemon ricotta ravioli (If you'll look at the one I had from the winter menu, you'll see that it's been changed up a bit! ), and I was given a vegan version of their artichoke flatbread. 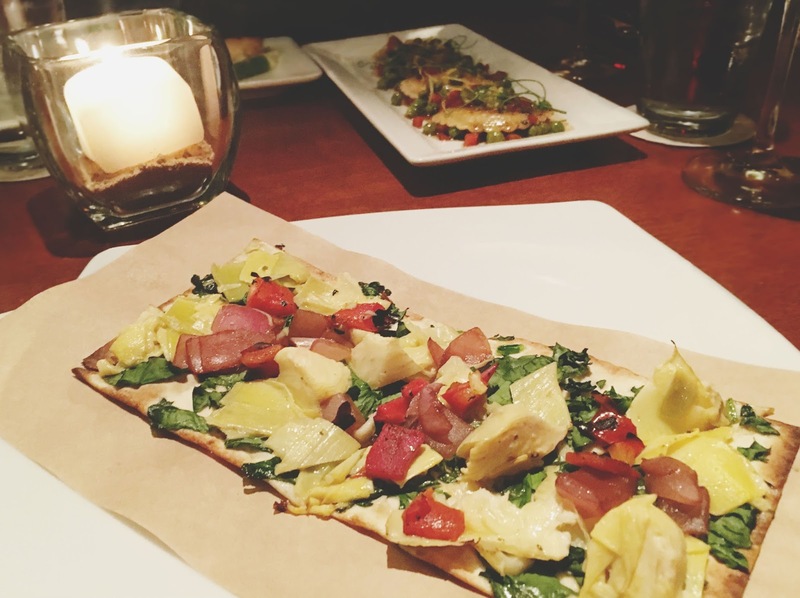 The flatbread itself was super crispy, and it was topped with ripe, tangy, caramelized vegetables. The lovely veggies that were included were artichokes, peppers, and red onions, topped with fresh basil. My favorite aspect was the onions, which added a nice, soft, sweetness to balance out the stronger other ingredients. This food course was paired with the Sinskey pinot noir, which was woodsier and heartier than your normal pinot noir. For our main course of food, Jon was presented with an Asian-glazed Chilean sea bass with organic black rice, snow peas, and shiitake mushrooms, as well as a wood-grilled rack of lamb served with spring vegetables, Yukon gold mash, and shallot jus. I was given a vegan version of the vegetarian tasting plate, a quinoa citrus salad, and a hummus duo. Since I'd had the vegetarian tasting plate last time (and it contained the quinoa citrus salad as well), I won't go into detail about those. 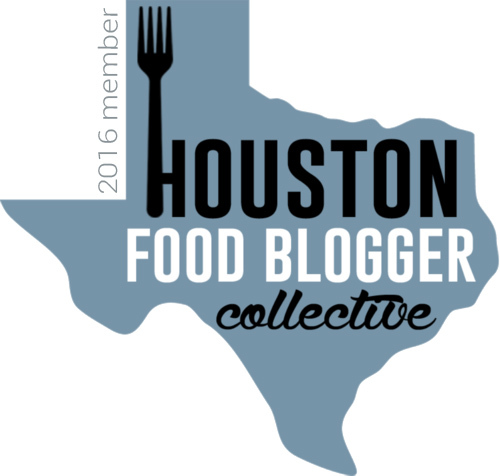 Just know that it was all great AGAIN - particularly that cedar plank tofu - and I still strongly stand behind the Honorable Mention I gave the tasting platter in my recent Houston restaurant favorites post! 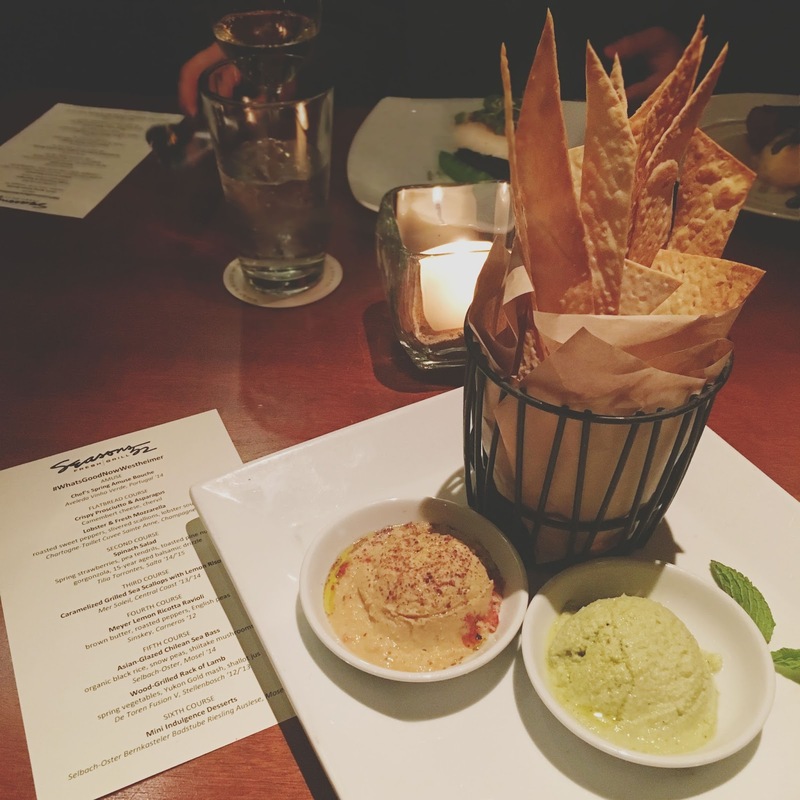 The hummus duo was a real treat - Served with crispy lavash, it contained a roasted garlic hummus topped with sumac, which was creamy, smooth, delicious, and had a slight kick. The second dip was an edamame hummus that was combined with lemon juice and mint. This one was more unique than the first, and had a subtler taste. I really enjoyed the nice, mint finish it had. With this course we were poured two different wines. The first was an incredibly sweet Selbach-Oster Riesling, and a De Toren Fusion red with some serious body! The final round of food was the dessert round, which I sat out on since none of the desserts were vegan (Don't worry, my vegan posts are coming to an end soon!). 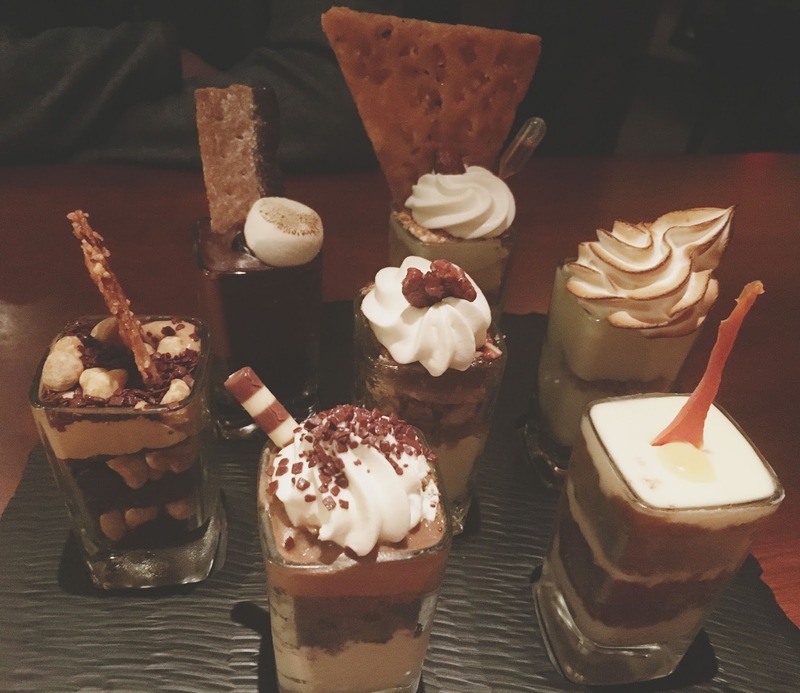 The desserts are small and manageable, and are presented to you in cute little shot glasses. Jon selected the chocolate-y, cappuccino dessert, as well as the amaretto almond seasonal dessert. He preferred the nutty, second dessert, which was served with a little shooter of amaretto that added a hint of sweetness. Our final glass of wine was a different Selbach-Oster riesling, which was very sweet, and had a prominent grape-y smell and taste. Once again, Jon and I had a wonderful evening at Houston's Seasons 52 on Westheimer. The fresh, seasonal food was impeccably prepared and absolutely lovely, and the restaurant's wine pairings were spot on. 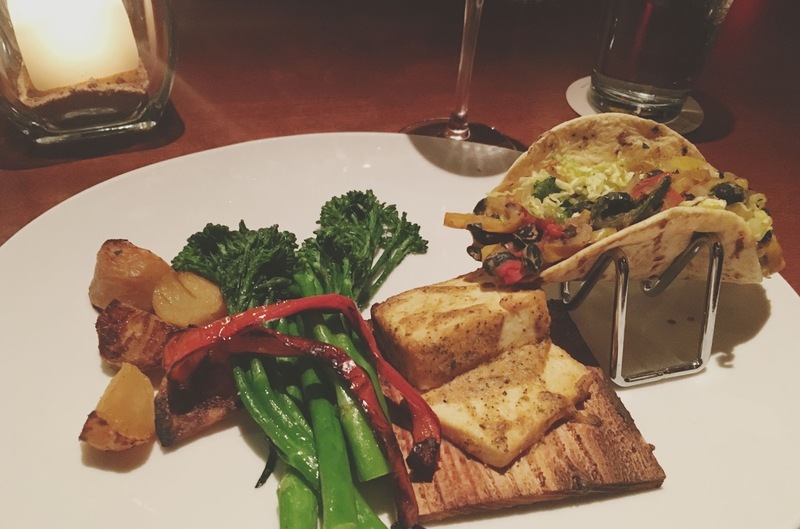 It also should be noted that Seasons 52 is incredibly accommodating to more restrictive diets. 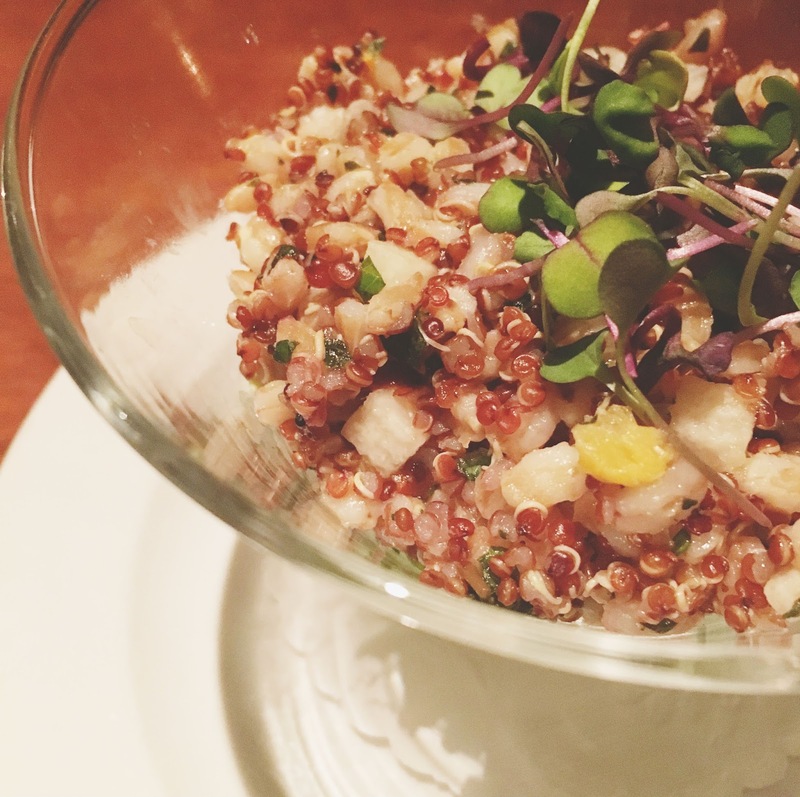 If you're looking to enjoy a nice night out at a Houston restaurant, Seasons 52 and its spring menu totally fit the bill!